Section of a “Dying Words” grid. Arlene Fisher has constructed more than 100 acrostic puzzles for AHMM. She recently answered some of our questions about her interests and career as a puzzle constructor. Her answers are below—and they include some clues for solving the Dying Words puzzle, which can be found at The Mystery Place and in every issue of AHMM (with the solutions appearing the following issue). You can find more puzzles through our sister publications at Penny Dell Puzzles. AHMM: Tell us a bit about your relationship with puzzles and puzzle-making. When did you become interested in puzzles? How long have you been a puzzle constructor, and how did you develop this skill? What inspires you? Arlene Fisher: My initial interest in puzzles was fostered by my 6th grade teacher who had my entire class subscribing to the New York Times and working as a team to solve the daily puzzle. And, of course, with her input, failure was never an option. By the time I finished 6th grade, I was hooked and although more years have passed than I care to calculate, that habit has persisted and my day is not complete until I solve the New York Times puzzle. I do not seek out any other puzzle, but if I stumble across one, I am compelled to solve it. Somehow, an empty crossword grid just doesn’t sit well with me. AHMM: What other types of puzzles do you construct? If you strictly build acrostics, why do these appeal to you? AHMM: What do you like to read? AF: By profession, I am a Licensed Clinical Social Worker and I work full-time so my spare time is limited as is my recreational reading. However, my favorite author is Nelson DeMille and more recently I’ve really enjoyed the non-fictional works of Erik Larson. AHMM: How do you find the quotes for the puzzles? AF: Finding appropriate quotes—especially ones with solid mystery themes—is always a challenge. 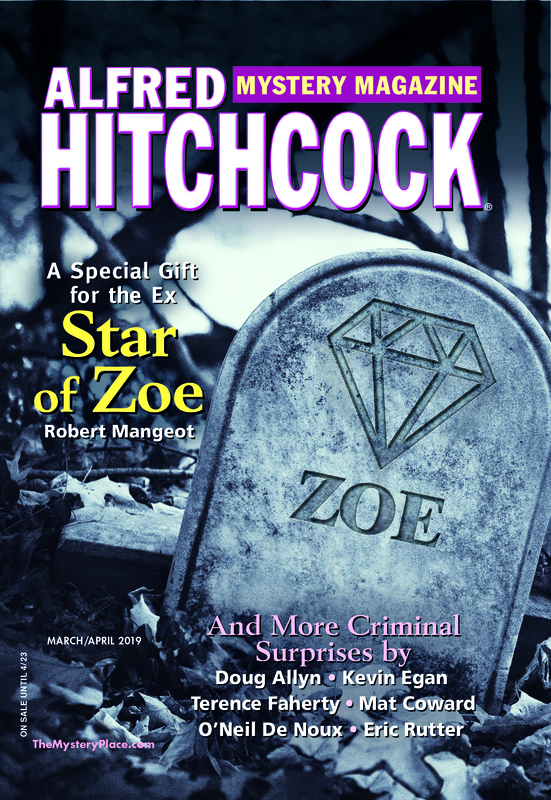 I subscribe to Mystery Scene Magazine primarily with the hope that each edition will be a source of unending quotes and each issue generally yields at least one suitable quote. I also skim the New York Times and the Wall Street Journal daily and always keep an eye out for a quote of interest. Book reviews, travel sections and human interest articles occasionally yield a quote here and there. AHMM: How do you think mysteries and puzzles work together? And what’s a good tip for our readers wishing to solve the Dying Words puzzle? AF: At the risk of sounding trite or stating the obvious, I believe that mysteries and puzzles are clones of sort . . . Both lure you in, require some thought and are solved by patience and logical thinking. There are times when solutions are elusive but perseverance usually provides the ultimate reward. So . . . for readers who are interested in solving the Dying Words puzzle . . . trust your instincts but be patient with yourself and do not hesitate to forge ahead. Most importantly, learn from your efforts. When success eludes you, check the answers the following month. In time, you learn to think like the constructor. How does that happen??? Well . . . that’s a mystery!! !